Home › Offenses › Notes on the "Read and React Offense"
Personal Notes on the "Read and React Offense"
Watch this preview and see what coaches at all levels are saying about the Read and React. 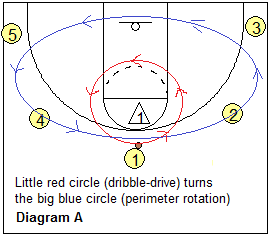 The Read and React offense was developed by coach Rick Torbett (BetterBasketball.com). Below is a review of this offense, and some of my thoughts about it after having used it for a few years (varsity boys). This is by no means complete, but hopefully gives you an idea of what it's about. 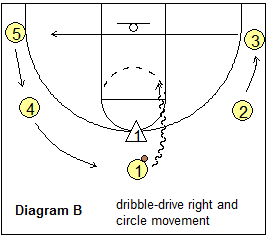 See Rick Torbett's Betterbasketball Read and React Offense for the complete package. Similar to but different from motion offenses. In R&R, player with ball ("initiator") has options to do multiple things. The other four players ("reactors") read and react to what the guy with the ball does, and there is only one correct off-ball movement. Very flexible... can use with almost any set... 3-2, 4-1, 5-out, 1-4 high, etc. 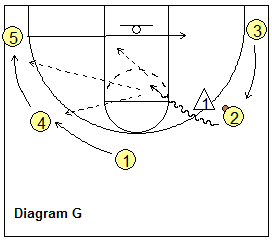 Can be used in an up-tempo, quick attack offense, and in transition, or in a deliberate, slow offense. You can use it as your delay offense without changing anything... just tell players "lay-ups only". 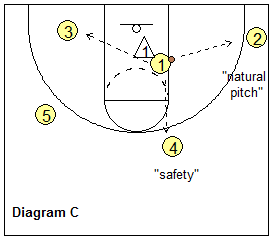 Can be used against both man-to-man and zone defenses... so you don't need a separate zone offense. You can run plays, but use the R&R rules once the play breaks down or fails. Is a "system"... taught in 17 layers. Could start in 5th grade with layers 1 and 2, and add a layer every year as the kids progress. You can start it out with your varsity, teach first few layers and gradually add the layers as the weeks progress... makes you a better offensive team by tournament time. Varsity level players can progress through the layers more quickly given their skill level and maturity. Makes your defense better by having to guard the R&R every day in practice. 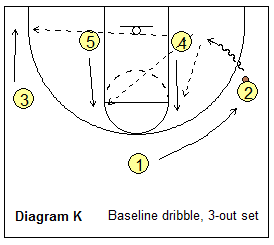 Teach this offense by using R&R breakdown drills every practice, and 5-on-5. Start with layer #1 and progress. Each layer must be learned before the next is added and becomes a "habit" (automatic without having to think). Each layer is taught using breakdown drills. Other 4 players use "circle movement" on the perimeter and rotate to fill the spots. 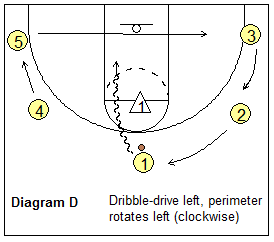 The direction of the dribble-drive (right or left) determines the direction of the perimeter rotation. If ball penetrates right, the circle rotates right (counterclockwise). If the ball penetrates left, the circle rotates left (clockwise). The only exception is dribble-penetration along the baseline (see below)... the opposite corner stays, so that the baseline dribbler has the option of passing out to the opposite corner. 1. 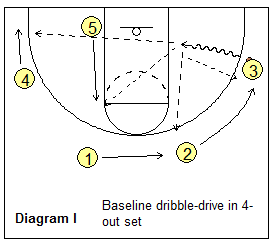 Dribble from the top... score, pitch out to corner-wing ("natural pitch") or back out to "safety valve" (back to the spot vacated by the dribbler), or dish inside. We always want to fill the spot where the penetrator started from, and this "safety" spot is often wide open. 2. 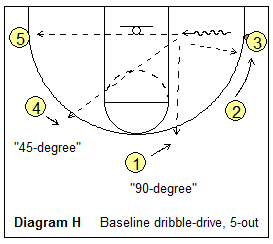 Wing dribble penetration... score, pitch out opposite, or dish inside. We always want the opposite corner filled for a kick-out pass. In our perimeter rotation with baseline dribble-penetration, we want these spots filled: the "safety", a "90-degree pitch", and a "45-degree pitch", in addition to filling the opposite corner. Opposite wing moves to corner. Post rotates up to 45 degree spot. Opposite wing rotates to 90 degree spot. 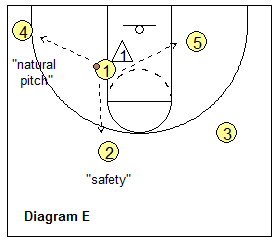 Ball-side wing rotates to vacated corner (safety). 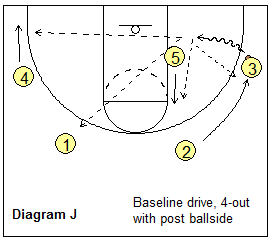 Diagram J shows the rotation when the post player is ballside. Here the post player I-cuts to the 90-degree spot, and the opposite top player (O1) stays put at the 45-degree spot, while O2 rotates to the safety spot. Opposite wing rotates to 45 degree spot. Point rotates to 90 degree spot. Opposite wing slides down to opposite corner. Both posts rotate up to 45 degree and 90 degree spots. Point rotates to vacated wing-corner (safety). 1. 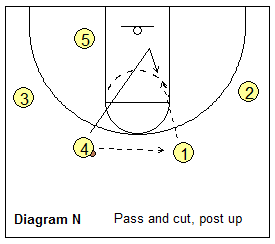 Passer... after passing, always basket-cut on a pass 1-spot away. 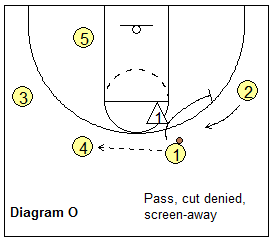 Generally, we want these cuts all the way to the hoop before filling out to the perimeter. 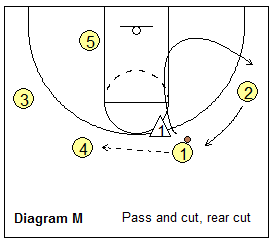 On a perimeter pass this would be either a front cut (diagram L), or a rear-cut if defender overplaying (diagram M). This cut eliminates the hedge defender once the ball is passed to the next spot. If the pass is made into the post (also just one spot away), then there will be either a Laker low cut, a Laker high cut, or a slide to the corner, or an "X-cut" (see Layer 12 below). Note that the passer does NOT cut on a skip pass (two spots away). 2. Pass receivers... if defender has a foot beyond the 3-point arc (aggressively denying pass), back-cut (diagram N). We call this "one foot over the read line" => back-cut. 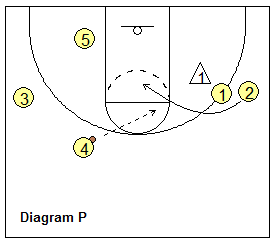 The next perimeter player over will naturally rotate into this vacated spot and is usually open. 3. After the cut, open spots are filled from the baseline up, and the basket-cutter fills the open corner spot. 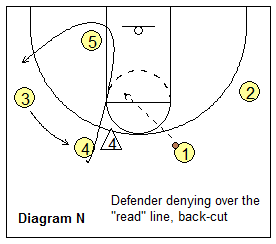 After passing, a cutter may be "stood up" by the defender who impedes and prevents his cut. Instead of fighting the defender, we use coach Bob Knight's "corner" principle... the cutter just simply moves sideways and screens-away (diagrams O and P). A perimeter player may wish to post up his defender inside (if he is a natural post player, or if he has a size mis-match, or if his defender is in foul trouble). 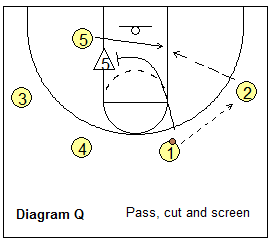 Diagram N shows O4 passing, cutting inside and then "shaping up to the ball", or posting up. A perimeter player may pass and cut and then screen for a post player inside before filling back out to the perimeter (diagram Q). We also call this "chipping" or "bumping" the post defender. So "pass and cut" becomes "pass, cut, and screen". 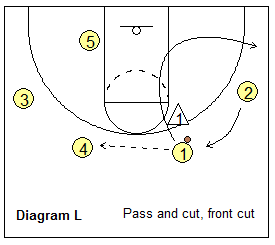 A perimeter player could also pass, cut and back-screen for another perimeter player (see Layer 8 below). 1. 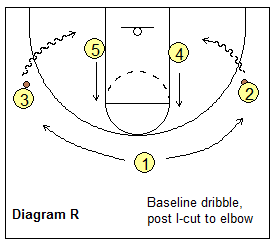 If dribble comes from baseline, post slides up to elbow (diagram R). 2. 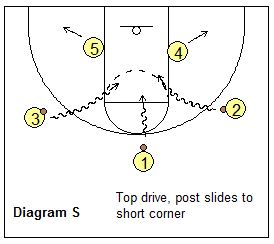 If dribble comes from the top, post moves to short corner (diagram S). 3. Rules 1 and 2 apply whether post if ball-side or weak-side. Watch this Rick Torbett's preview of the Read and React. 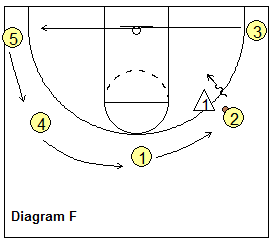 See Rick Torbett's Betterbasketball Read and React Offense for the complete package.